Legends II was formed by Legends Exploration, a geological exploration group including John Amoruso, Denny Bartell and Larry Bartell who are best known for their discovery of the Amoruso Field in Robertson County, TX and subsequent formation of Leor Energy, and Branta LLC, a strong exploration and development group led by Fred Tresca. The Legends team’s last discovery was one of the most successful onshore gas fields discovered in the last decade, with three wells producing over 50 MMcf/d each and more than 215 MMcf/d of total production. Leor Energy sold 50% of its interest in Amoruso Field to EnCana in 2007 for $2.6 billion. Legends Exploration and Branta LLC teamed up with operator Harvest Natural Resources, who is funding the first $20.0MM of expenses on an exploration AMI which runs along the Texas and Louisiana Upper Gulf Coast area. 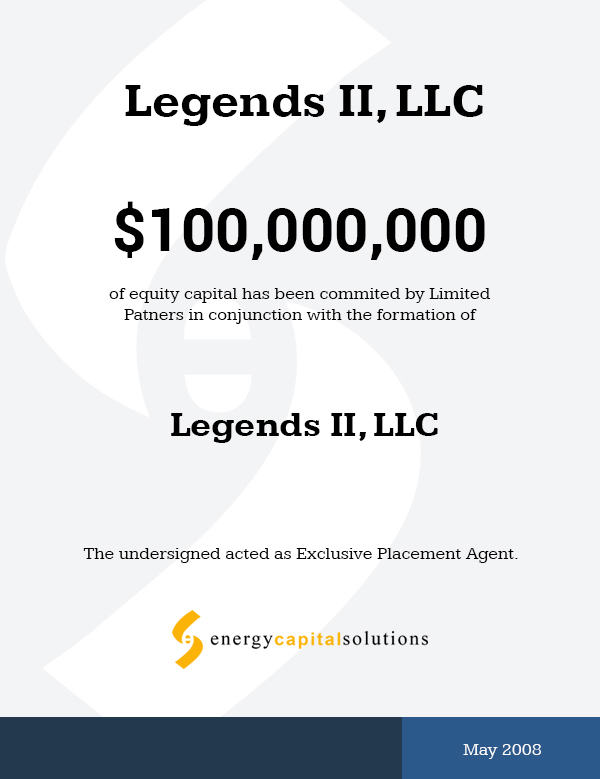 January 21, 2008 – ECS was engaged by Legends II, LLC (“Legends”) to raise approximately $100.0MM of private equity capital to pursue several exploration targets within an AMI identified by the Legends II team. May 28, 2008 – Legends closed on a $100.0MM equity commitment provided by ArcLight Capital Partners, four months after engagement. Total Commitment – $100.0MM, $11.0MM initial draw. Transaction Structure – $100.0MM common equity investment; initial draw is in the form of senior debt, convertible into common equity upon funding of any subsequent draw. Management Incentive Structure – Legends II management receives successively more of the incremental cash flows as it achieves reasonable hurdle rates for ArcLight. Additionally, Legends II management may invest alongside ArcLight for up to 10% of the total capital commitment and receive additional carry.